Q1:What should I do when I desire to enter Japan? A1: You must have your passport to be issued by the government first of all. And then, according to the purpose of your entering Japan, you should have a proper visa issued by Japanese embassy etc. Q2:What kind of procedures are required when I have arrived at Japan? A2:When you arrive at Japan, you are to be examined by the officers in the immigration bureau. Then, you will have your passport stamped with "landing permission." The conditions to landing permission are below. * In principle, your visa should have been stamped on your passport. * Your purpose of entering Japan is proper for the staus of residence in Japan. * That you do not fall within any one of the reasons for Denial of Landing. Any political party or organization that encourages an act of dispute such as stopping or preventing normal maintenance or operation of security equipment of a plant or place of work. (14) Any person except those coming under the preceding items who the Minister of Justice has reasonable grounds to believe is likely to commit an act which could be detrimental to the interests or public security of Japan. Q3:What qualifications are required to reside in Japan? Diplomat Activities on the part of constituent members of diplomatic missions or consular offices of foreign governments hosted by the Japanese Government; activities on the part of those who are provided with similar privileges and/or immunities as are granted to diplomatic missions in accordance with treaties or international customary practices; and activities on the part of their family members belonging to the same household. Official Activities on the part of those who engage in the official business of foreign governments or international organizations recognized by the Japanese Government; and activities on the part of their family members belonging to the same household (excluding the activities described in this table's "Diplomat" column). Professor Activities for research, direction of research or education at colleges, equivalent educational institutions or "Kotosenmongakko". Artist Activities for the arts that provide income, including music, the fine arts, literature, etc. (excluding the activities described in the "Entertainer" column of Table (2)). Activities dispatched by foreign religious organizations. Journalist News coverage and other journalistic activities conducted on the basis of a contract with foreign journalistic organizations. Manager Activities to commence the operation of international trade or other business, to invest in international trade or other business and to operate or manage that business, or to operate or manage international trade or other business on behalf of the foreign nationals (including the foreign corporations; hereinafter in this section foreign national is to include foreign corporation) who have begun such an operation or have invested in such a business (excluding the activities to engage in the operation or management of the business which are not allowed without the legal qualifications described in this table's "Legal/Accounting Services" column). 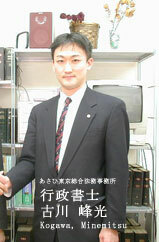 Services Activities to engage in the legal or accounting business, which is required to be carried out by "GaikokuhoJimubengoshi", "Gaikokukoninkaikeishi" or those with other legal qualifications. Medical Services Activities to engage in medical treatment services, which are required to be undertaken by physicians, dentists or those with other legal qualifications. Researcher Activities to engage in research on the basis of a contract with public or private organizations in Japan (excluding the activities described in the Professor column of Table (1)). Instructor Activities to engage in language instruction and other education at elementary schools, lower secondary schools, upper secondary schools, secondary educational schools ("Chutokyoikugakko"), special schools for the visually impaired, handicapped children's schools, advanced vocational schools ("Senshugakko"), vocational schools ("Kakushugakko") or the other educational institutions equivalent to vocational schools in facilities and curriculum. Engineer Activities to engage in services, which require technology and/or knowledge pertinent to physical science, engineering or other natural science fields, on the basis of a contract with public or private organizations in Japan (excluding the activities under "Professor" column of Table (1) and excluding the activities described in the "Investor/Business Manager", "Medical Services", "Researcher", "Instructor", "Intra-company Transferee" and "Entertainer" columns of this Table). national Services Activities to engage in services, which require knowledge pertinent to jurisprudence, economics, sociology or other human science fields or to engage in services which require specific ways of thought or sensitivity based on experience with foreign culture, based on a contract with public or private organizations in Japan(excluding the activities described in the "Professor", "Artist" and "Journalist" columns of Table(1)and excluding the activities described in the "Investor/Business Manager", "Legal/Accounting Services", "Medical Services", "Researcher", "Instructor", "Intra-company Transferee" and "Entertainer" columns of this Table). Transferee Activities on the part of personnel who are transferred to business offices in Japan for a limited period of time from business offices which are established in foreign countries by public or private organizations which have head offices, branch offices or other business offices in Japan and who engage at these business offices in the activities described in the "Engineer" or "Specialist in Humanities/International Services" column of this Table. Entertainer Activities to engage in theatrical performances, musical performances, sports or any other show business (excluding the activities described in the "Investor/Business Manager" column of this Table). Skilled Labor Activities to engage in services, which require industrial techniques or skills belonging to special fields on the basis of a contract with public or private organizations in Japan. Cultural Activities Academic or artistic activities that provide no income, or activities for the purpose of pursuing specific studies on Japanese culture or arts, or activities for the purpose of learning and acquiring Japanese culture or arts under the guidance of experts (excluding the activities described in the columns from "College Student" to "Trainee" in Table(4)). Temporary Visitor Sightseeing, recreation, sports, visiting relatives, going on inspection tours, participating in lectures or meetings, business contact or other similar activities during a short period of stay in Japan. College Student Activities to receive education at colleges or equivalent educational institutions, specialized courses of study at advanced vocational schools ("Senshugakko"), educational institutions designated for preparing persons who have completed 12 years of education at schools in foreign countries to enter college, or "Kotosenmongakko". Student Activities to receive education at high schools(excluding the latter courses of secondary educational schools("Chutokyoikugakko")), high school courses of special schools for the visually impaired or of handicapped children's schools, higher or general courses of advanced vocational schools ("Senshugakko"), or vocational schools ("Kakushugakko") (excluding the educational institution described in the "College Student" column of this table)or other educational institutions which are equivalent to vocational schools in facilities and curriculum. Trainee Activities to learn and acquire the technology, skills or knowledge at public or private organizations in Japan(excluding the activities described in the "College Student" and "Pre-college Student" columns of this Table). Dependent Daily activities on the part of the spouse or unmarried minor child of those who stay in Japan with the status of residence mentioned in Tables (1), (2) or (3) (excluding "Diplomat"," Official" and "Temporary Visitor") or of those who stay with the status of residence of "College", "Pre-college" or "Trainee" in this Table. Activities Activities which are specifically designated by the Minister of Justice for foreign individuals. Resident Those who are permitted permanent residence by the Minister of Justice. National The spouses of Japanese nationals, the children adopted by Japanese nationals in accordance with the provisions of Article 817-2 of the Civil Code(Law No.89 of 1896)or those born as the children of Japanese nationals. Resident The spouses of those who stay with the status of residence of "Permanent Resident" or Special Permanent Resident(hereinafter referred to as "permanent resident etc. "), those born as children of a permanent resident etc. in Japan and having been residing in Japan. Q4:Under what circumstances are foreigners to be deported from Japan? 3) Any political party or organization that encourages an act of dispute, such as, stopping or preventing normal maintenance or operation of security equipment of a plant or a place of work. Any person except those coming under Subitems (a), (b) and (e) to (n), who the Minister of Justice determines has committed acts detrimental to the interests or security of Japan. (4)-3 Any person whose status of residence is Temporary Visitor, and has illegally killed, injured, assaulted or threatened a person, or damaged or destroyed a building or other thing in relation to the process or result of an international competition, etc. held in Japan or with intention to prevent the smooth operation thereof, at the venue of the international competition, etc. or within the area of a municipality where the venue is located (This refers to "ward" where Tokyo Special Wards exist or for cities designated in Article 252-19, Paragraph 1 of the Local Autonomy Law.) or in a neighboring place provided for use by unspecified or many people. (5)-2 Any person who has been ordered to leave Japan based on the provisions of Article 10,Paragraph 10, or Article 11, Paragraph 6 but does not leave without delay. (6)-2 Any person who has been designated a period based on the provisions of Article 16, Paragraph 7, but does not return to his vessel or leave Japan within that period. (7) Any person provided for in Article 22-2, Paragraph 1, who stays in Japan beyond the period prescribed in Article 22-2, Paragraph 1, without receiving permission pursuant to the same Article Paragraph 3, applicable correspondingly to Article 20, Paragraphs 3 and 4 or pursuant to Article 22-2, Paragraph 4, applicable correspondingly to Article 22, Paragraphs 2 and 3. Q5:What kinds of procedures should I take if I need change my Status of Residence? A5:An alien who has a status of residence may have his status of residence (in the case of an alien residing under the status of residence of Designated Activities, the activities specifically designated by the Minister of Justice in respect of the person concerned are to be regarded as a status of residence) changed (including the period of stay thereon; hereinafter the same in Paragraphs 1 or 3). Any alien who wishes to have his status of residence changed pursuant to the provision of the preceding paragraph shall apply to the Minister of Justice for the change of status of residence in accordance with the procedures provided for by the Ministry of Justice Ordinance. However, if he desires to change his status of residence to that of Permanent Resident, he shall comply with the procedures provided for in Article 22, Paragraph 1. When an application for change of status of residence has been submitted, the Minister of Justice may grant permission only when he finds that there are reasonable grounds to grant the change of status of residence on the strength of the documents submitted by the alien. However, in the case of an application submitted by a person whose status of residence is Temporary Visitor, permission shall not be granted unless the application is made based on a special unavoidable circumstances. When the permission mentioned in the preceding paragraph has been granted, the Minister of Justice shall have an Immigration Inspector enter the new status of residence and period of stay in the passport of the alien if he has a passport in his possession, or issue to the alien a Certificate of Status of Residence with new status of residence and period of stay entered or enter the new status of residence and period of stay in a previously issued Certificate of Status of Residence if he does not possess a passport. In such a case the contents of the pemission will become effective as of the time the entrance or issuance is made. Q6:Under what circumstances can I be given a Special Permission for Residence? (3) The Minister of Justice finds grounds for granting special permission to stay, other than the previous two subparagraphs. Q7:I want to know how to get the Permanent Residence Status. A7:Any alien who seeks to change his status of residence to that of Permanent Resident shall apply to the Minister of Justice for permission of permanent residence in accordance with the procedures provided for by the Ministry of Justice Ordinance. When the application provided for in the preceding paragraph has been submitted, the Minister of Justice may grant permission only when he deems that the alien conforms to the following items and that his permanent residence will be in accordance with the interests of Japan. However, the following items shall not require conformity in the case of spouses and children of Japanese, those who have Permanent Residence status or those who are Special Permanent Residents described in the Special Law on the Immigration Control of inter alia, Those Who Have Lost Japanese Nationality on the basis of the Treaty of Peace with Japan. (Law No. 71 of 1991, hereinafter referred to as Special Permanent Resident). (2) The alien must have sufficient assets or ability to make an independent living. Q8:Please tell me about Immigration Inspector's Examination. (2) Activities to be engaged in Japan stated in the application must not be false, and must fall within one of the activities described in the right-hand column of Annexed TableI, (in respect of the activities described in the right-hand column of Annexed TableI (5), the proposed activities must be activities designated by the Minister of Justice in the Official Gazette), or the activities of a person with the civil status or position described in the right-hand column of Annexed TableII (the civil status or position in the right-hand column under Permanent Resident shall be excluded; in respect of the position specified under Long Term Resident, the proposed position must be one of the positions designated by the Minister of Justice in the Official Gazette), and shall fulfill in respect of those who intend to engage in the activities described in the right-hand column of Annexed TableI (2) and (4) the requirement provided for by the Ministry of Justice Ordinance which shall be stipulated in consideration of factors including but not limited to the effect on Japanese industry and public welfare. (4) The alien must not fall within any one of the items of Article 5, Paragraph 1. The alien subject to the examination provided for in the preceding paragraph shall establish the fact that he meets the landing requirements stipulated therein. Q9:Please tell me about Certificate of Authorized Employment. A9:When an application is submitted by an alien residing in Japan, the Minister of Justice may issue a document which certifies the eligibility of the applicant for activities involving the management of a business involving income or activities for which he receives remuneration in accordance with the provisions of the Ministry of Justice Ordinance. No one shall discriminate in employing, etc. an alien for failure to show or submit the certificate mentioned in the preceding paragraph, when it is evident that the person concerned is authorized to engaged in the activities involving the management of a business involving the income or activities for which he receives remuneration. Q10:What kinds of procedures should I take if I need to extend my Period of Stay? A10:Any alien residing in Japan may, without changing his status of residence, have his period of stay extended. Any alien who wishes to extend his period of stay pursuant to the provision of the preceding paragraph shall apply to the Minister of Justice for the extension of such period in accordance with the procedures provided for by the Ministry of Justice Ordinance. When the application provided for in the preceding paragraph has been submitted, the Minister of Justice may grant permission only when there are reasonable grounds to grant the extension of the period of stay on the strength of documents submitted by the alien. When the permission provided for in the preceding paragraph has been granted, the Minister of Justice shall have an Immigration Inspector enter the new period of stay in the passport of the alien if he has a passport in his possession, or issue to the alien a Certificate of Status of Residence with status of residence and new period of stay entered or enter the new period of stay in a previously issued Certificate of Status of Residence if he does not possess a passport. In such a case the provisions of the last sentence of Paragraph 4 of the preceding article, shall apply mutatis mutandis. This office is a full-scale office by the specialist, whose licenses contain "The Japan Business Law Examination" by Tokyo Chamber of Commerce and Industry ,which is an examination of the capability of the lawyers who are doing business of judicial affairs, he has the score of the 1st ranking in Japan in 3531 persons.